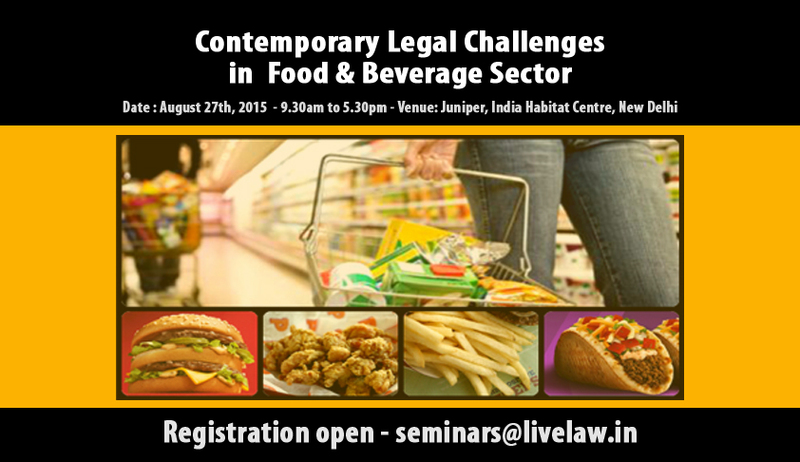 In the wake of recent developments on the regulatory aspects of food safety and standards, LiveLaw is organising a one-day seminar on “Contemporary Legal Challenges in Food & Beverage Sector”. The Indian food and beverage industry is considered as a high profit making sector. Indian food and beverages industry is largely regulated by 'Food Safety and Standards Act 2006& Rules'. Since India is known for its multiple regulatory framework and structure, the workshop would be benefiting the stakeholders who wanted to be exposed to the regulatory framework and legal challenges. Seminar will be giving a holistic insight into the Act and its implementation by the active involvement of experts in the field of Food Safety and Standards. Dr. S.S. Ghonkrokta, IAS, Special Secretary & Special Commissioner, Food & Distribution, Government of Delhi, Dr. Madhavan, Former Asst. Director (Enforcement) in Food Safety and Standards Authority of India (FSSAI), G.Ramakrishna Prasad, Advocate, Supreme Court of India, and other subject experts would be dealing with subjects like Food Safety and Standards Act and its legal implications in general and specific issues like Licensing & Registration, Enforcement Procedure, Food Specific Packaging, Label Requirements, Adjudications and Appeals under FSSA Act etc , followed by a panel discussion by industry leaders.